with Captain Hurricane and assistant co-ordinator Tash Farrow. FOR the past six weeks, the Glenora in2cricket participants have been learning the skills of the great game. Last Sunday’s session was extra special a visit by the competition mascot, Captain Hurricane. 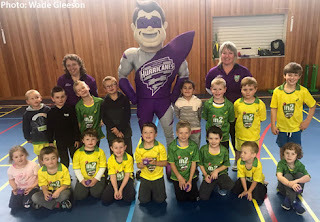 Captain Hurricane and his buddy took the children through many drills which they thoroughly enjoyed from start to finish. There are still two more sessions to go and co-ordinator Annie McKenzie and her assistant Tash Farrow have been doing a great job. A special mention must also go to the parents who have joined in and helped out. It is much appreciated. The kids have been improving their skills from week to week and most importantly have enjoyed the experience. Well done to all involved. PICTURED, back row from left: Annie Mckenzie (co-ordinator), Captain Hurricane and Natasha Farrow (assistant). Middle row from left: Lewis Glover, Brax King, Jack Embrey, Deegan Denny, Palasa Roberts, Izaak Madden, Dayne Simpson, Xavier Galgoci. Front from left: Olivia Whittaker, Kaiden Hall, Hunta Wiggins, Henry Whittaker, Steele Quarrell, Cooper Gleeson, Lucas Jones, Hayden Clark and Oliver Johnston.